Jaeger-LeCoultre pieces customized by Sir Jonathan Ive and Marc Newson go under the hammer at (RED) AUCTION There is big news when it comes to the RED Auction, which celebrates the best in terms of design and innovation... on November 23. Sir Johnathan Ive, KBE, accompanied by Marc Newson, CBE, have been working together with renowned musician and philanthropist Bono to launch the RED Auction. Together, Ive and Newson have been hard at work over the past year and a half curating the collection… which is bound to impress the most picky consumers. Among other objects, the collection will include objects from disciplines as diverse and far-fetching as space travel and lighting design to contemporary art and rare automobiles. What unites these objects, one may wonder? Simply the fact that they have been craftedby people motivated by notions of superiority and innovation. There is a good cause behind the event, too. Proceeds from the 23 November 2013 sale at Sotheby’s New York will benefit The Global Fund to fight diseases such as AIDS, tuberculosis and malaria. In addition, the auction will feature icons of design selected by Ive and Newson and works which were personally customized by the pair. For example? Visitors can look forward to seeing a custom Jaeger-LeCoultre Atmos 561 clock with unique red accents created for the (RED) Auction. Or, you can expect to admire a Memovox Tribute to Deep Sea watch which has been customized with a unique red dial and the (RED) logo engraved on the back of the watch. "It's been a thrilling journey for Ive and I to curate this collection of pieces that celebrate extraordinary design that we love, that transcends all boundaries of time and place,” said Newson. “Each object and the process of creating it conveys a rich set of human values, so it seems fitting that they should be auctioned with a different sense of human value in mind, to raise as much as possible to help people's lives today." “We'd like to thank our partners for their sincere generosity and for giving so gladly and willingly,” added Newson. His colleagues tend to agree with him. “This is a great honour for Jaeger-LeCoultre to be part of this global project in association with Sotheby’s and support a true sustainable cause (RED) has been fighting for since 2006”, said Daniel Riedo, CEO of Jaeger-LeCoultre. “Calling upon the Manufacture’s creativity and watchmaking savoir-faire, reinterpreting two of our iconic timepieces with the recognition of two great names of Design has been even more thrilling.” Jaeger-LeCoultre chose to reinterpret this legendary timepiece specifically for the 2013 (RED)TM Auction, starting off with three pieces whose design remain loyal to the original Europe version of the Memovox Tribute to Deep Sea… but with a few differences thrown in (such as the unique red dial). The RED logo is engraved on the back of the watch. 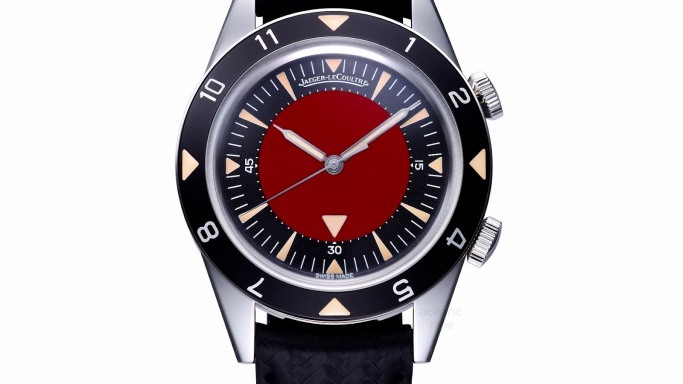 It was back in 1959 when Jaeger-LeCoultre presented the Memovox Deep Sea watch, its very first automatic diver’s watch equipped with an alarm, of which there were two versions: one intended for European sports afacinados, and the other for American divers. By 2011, the manufacture paid tribute to the historical model with the Memovox Tribute to Deep Sea watch, a limited series re-edition. This watch comes equipped with a 40.5mm-diameter steel case and is powered by the automatic Memovox Calibre 956. In addition, visitors can expect to see the Jaeger-LeCoultre Atmos 561 by Marc Newson clock. It features red accents on the hands, the indication of the month and the calibre’s logo. The Jaeger-LeCoultre Memovox Tribute to Deep Sea will be available to view at pre-auction exhibitions at Sotheby’s in Hong Kong and London. The Hong Kong exhibition will take place between October 3 and 7, whereas the London exhibition will be launched between October 12 and 20. Jaeger-LeCoultre has been heralded by other innovators for its wonderful, breathtaking creations, such as the Atmos Mystérieuse (2003), the Gyrotourbillon 1 (2004), the Reverso Grande Complication à Triptyque (2006), the Master Compressor Extreme Lab 1 (2007), the Reverso Gyrotourbillon 2 (2008), the Duomètre à Grande Sonnerie (2009), the Master Grande Tradition Grande Complication (2010), the Reverso Répétition Minutes à Rideau (2011), the Duomètre Sphérotourbillon (2012) and the Master Grande tradition Gyrotourbillon 3 Jubilee (2013).